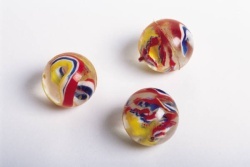 Three red marbles - A story of Kindness! I was at the corner grocery store buying some early potatoes.... I noticed a small boy, delicate of bone and feature, ragged but clean, hungrily appraising a basket of freshly picked green peas. 'I can see that. Hmmmmm, only thing is this one is blue and I sort of go for red. Do you have a red one like this at home?' the store owner asked. Ahead of us in line were three young men. One was in an army uniform and the other two wore nice haircuts, dark suits and white shirts...all very professional looking. They approached Mrs. Miller, standing composed and smiling by her husbands casket. Each of the young men hugged her, kissed her on the cheek, spoke briefly with her and moved on to the casket. Her misty light blue eyes followed them as, one by one; each young man stopped briefly and placed his own warm hand over the cold pale hand in the e casket. Each left the mortuary awkwardly, wiping his eyes. They just told me how they appreciated the things Jim 'traded' them.. Now, at last, when Jim could not change his mind about color or size....they came to pay their debt.